Sign up below for your free Smart Living Weekly e-subscription. Each week, you will receive our e-magazine at the email address you enter below. You can unsubscribe at any time. 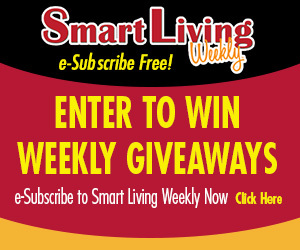 You will also be automatically entered into this week’s Smart Living weekly giveaway. For complete contest entry rules, please visit our Official Contest Rules (click here). How did you hear about our e-subscription?